I've been a lazy blogger for the last week due to prepping for Christmas and travel. 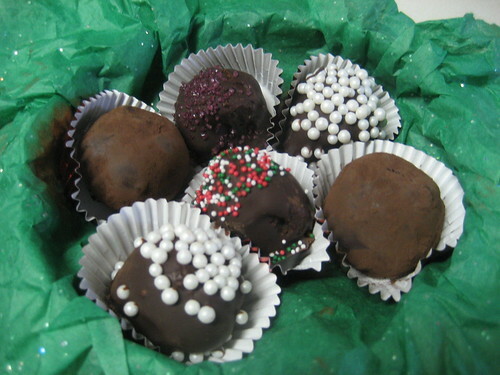 Now that my presents are all wrapped (and opened), here are some yummy Christmas goodies. I don't trust people who don't like truffles. Dark chocolate covered in more dark chocolate. I used Giada De Laurentis' recipe, minus the lollipop sticks in them. These were actually pretty easy to make, and only have a couple ingredients (and since those ingredients are chocolate and heavy cream, who could complain?). I also added some of my dad's "special spice," which is pretty much Pumpkin Pie Spice, which I use in a lot of baked goods: cinnamon, nutmeg, all spice, clove, and cardamom. 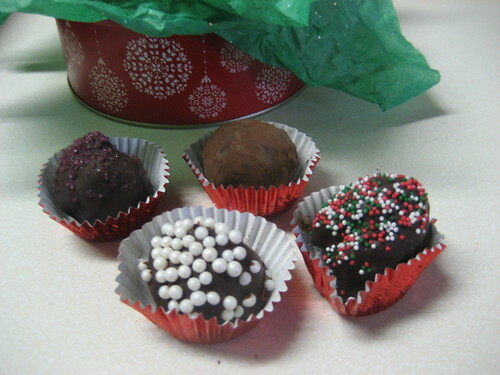 To make them pretty, I used the following toppings: purple sea salt, cocoa, pearl sprinkles, and Christmas nonpareils. These came out really well, and the cinnamon/nutmeg mixture really helped give them some personality. Just remember to keep them in the fridge or they'll get a little too liquidy. 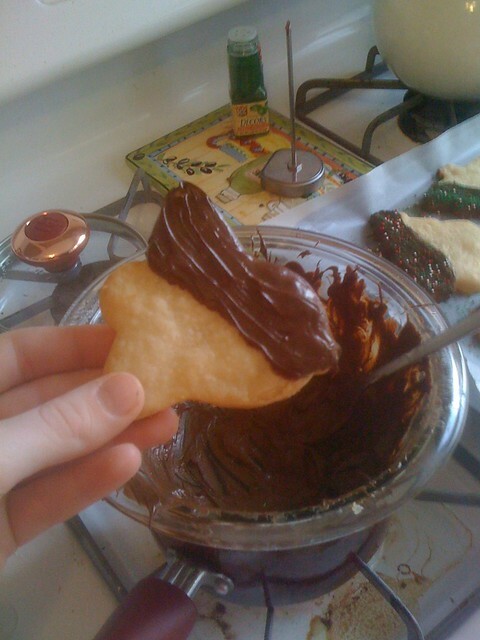 I already posted about homemade shortbread here, but my Christmas shortbread included fun holiday shapes. I used Ina Garten's recipe, which is simple and delicious. I definitely recommend following her tip and placing the cut-out cookies on the cookie sheet into the fridge for 20-30 minutes before you bake them. This will help keep the edges sharp, which is especially important if you cut special shapes. After the cookies cooled, I dipped them in semisweet chocolate (chocolate chips melted in a double boiler, aka a glass bowl balanced over a pot of simmering water). 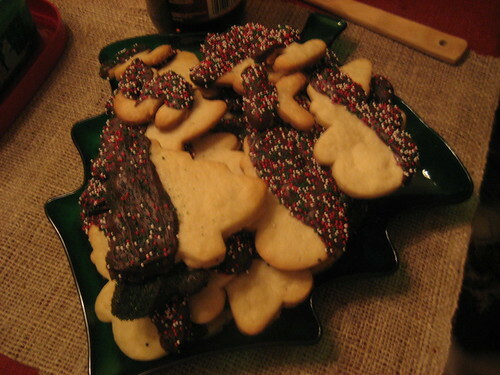 Then I immediately doused each cookie in festive sprinkles. Yum. Note: if you are looking for a shitload of cookie cutters at a great price, I found a 100-piece set at Bed Bath & Beyond for $9.99, which includes all sorts of fun shapes, including letters and numbers (and, of course, Christmas shapes!). 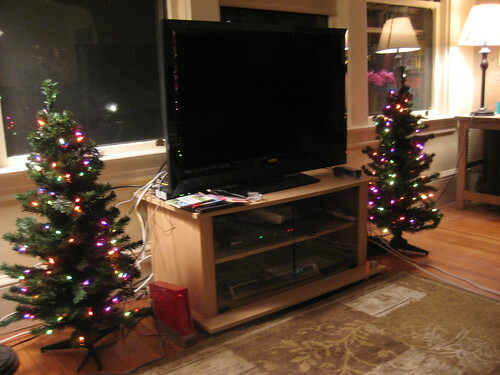 Mini Christmas trees. These babies are about 3 feet high and come pre-lit. As I often profess my love for all things miniature, these are perfect to flank our TV (and our new Super Mario Brothers Wii!). Monogrammed stockings. I saw classy-looking monogrammed stockings for sale at Bed Bath and Beyond for about $12 each. a) They didn't have an H, K, or S, and b) I didn't feel like spending $48 on stockings. So I improvised! 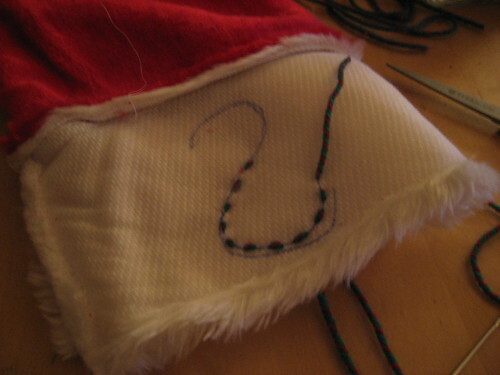 These basic stockings cost $3.99 a piece, so I took it upon myself to learn how to embroider, if only barely. See here for instructions on the double running stitch, which I used. I found a really festive green and red ply yarn that I used. After finishing the letters, I made those curly-Qs on each stocking by crocheting one row of single crochet with the same yarn. 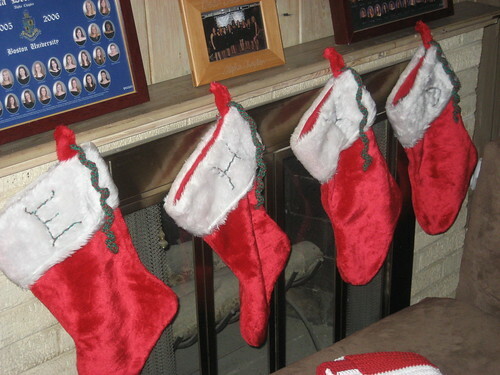 Yes, there are 3 residents of our apartment and four stockings. Our honorary roommate, Sara, whose bedroom is either the sun room or the basement, depending on who you ask, also got one. Neither of my roommates or I will actually be in our apartment on Christmas, but a little holiday cheer is still necessary until we leave town. Building off of my Thanksgiving decor, I left the central color as red and put together a few Christmas-y pieces. 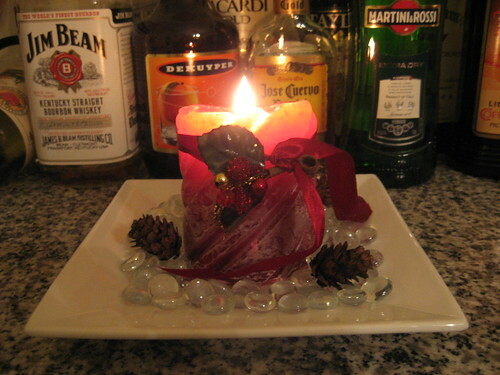 This is the same candle and plate that I had on our bar for Thanksgiving, but I swapped the fall glass beads for clear ones, added a couple tiny pinecones from some potpourri (see below), and reattached the ribbon that came with the TJ Maxx candle. It's cranberry scented, which I figure works for all seasons. All the components are from Bed Bath and Beyond, which can get a little pricey. If I had had more time, I would've gone to Marshall's to scope things out, but all in all, I didn't get hosed that bad. Extra step: I thought about doing this really neat "frosty salted candle" idea from Martha Stewart, but I decided that since the pinecones were already covered in glitter, the candles would look better as is. 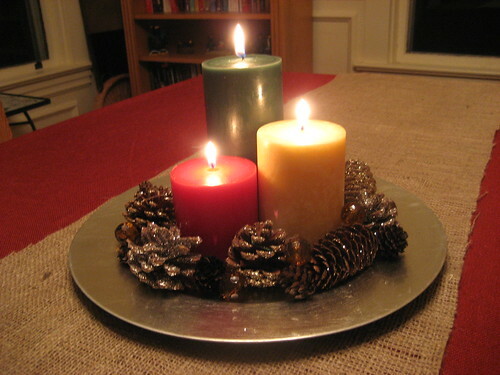 All you have to do is coat pillar candles in Modge Podge glue and roll them in a tray of epsom salts. Very charming. Tomorrow, check out the holiday touches in our living room! 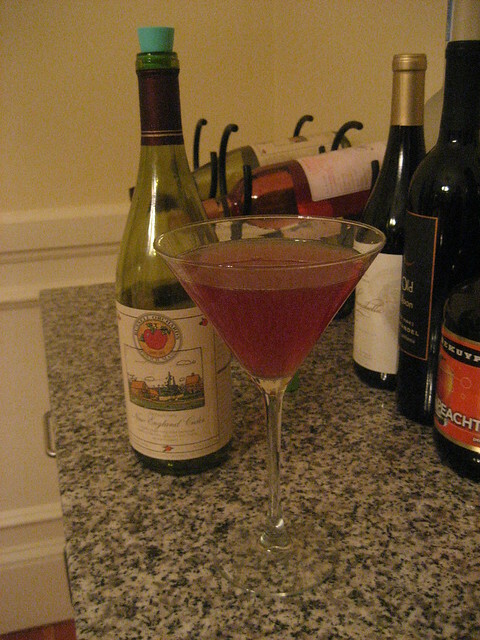 That's what I've decided to name this cocktail, since "something"-tinis are getting kind of old. The New England Fizz combines some signature New England flavors to create a fruity (yet not too sweet) cocktail. 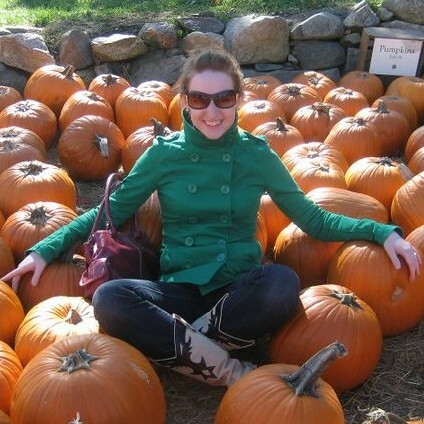 When my roommies and I went apple picking at Russell Orchards in Ipswich, MA, we stocked up on one of their specialties: sparkling hard cider. I chose the "slightly sweet" version, after deciding the "dry" variety I bought last year was akin to apple cider vinegar. I don't like sweet wines, but the "slightly sweet" bottle was the perfect balance. Now, bring on some cranberries and you've got yourself the perfect North Shore drink. I prefer gin in my drinks, but this would work fine with vodka too, if that's your poison. Combine gin, juices, and ice in a shaker. Shake! Strain into a chilled martini glass and top off with sparkling cider. The result is a crisp, tart, fizzy delight. I love pot pie. No, I don't think you understand. It's the best food ever. 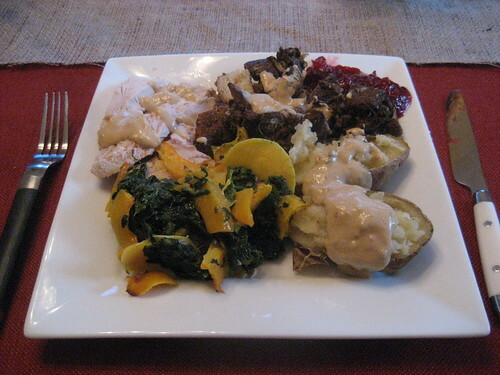 And a perfect way to use leftover Thanksgiving turkey! Seeing as we had a 16 lb turkey for three people, we had a fair amount of leftovers. 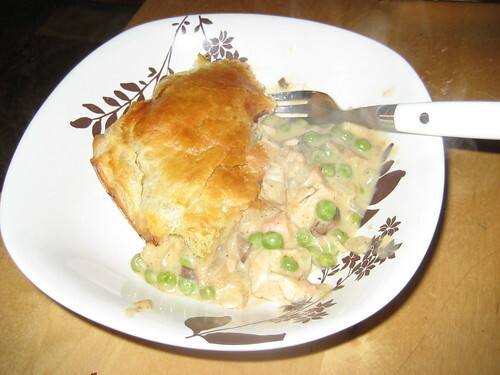 Turkey sandwiches got kind of boring, and a pot pie is obviously much more amazing than some stupid sandwich. I made my recipe up as I went along, and it's pretty basic. (See below for full deets.) 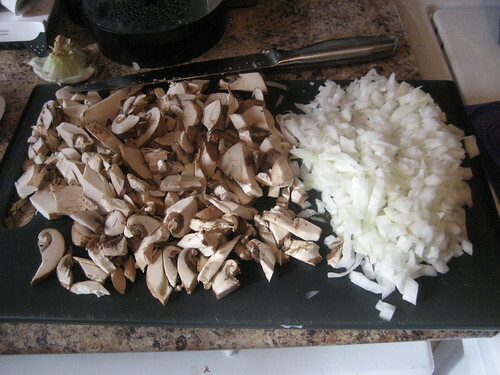 I also had extra onions and mushrooms that didn't go into the stuffing, so I made sure to work those in. 1. Preheat oven to 400F. 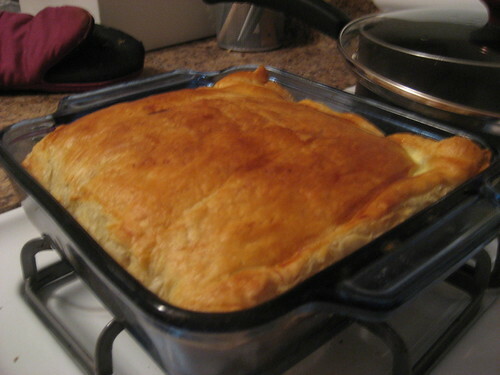 Make sure puff pastry is out of the freezer and thawing. 2. In a skillet, sautee butter with onion. When they're getting soft, add mushrooms and garlic. 3. 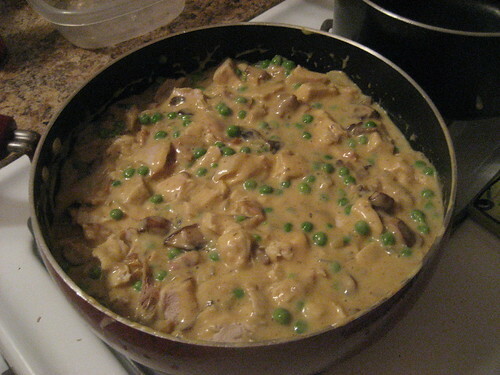 Add the condensed soup, peas, and turkey. Bring to a low boil and let simmer for 5 minutes. 4. Roll out puff pastry sheets to about 14" squares. 5. Grease a 8"x8" glass baking dish. 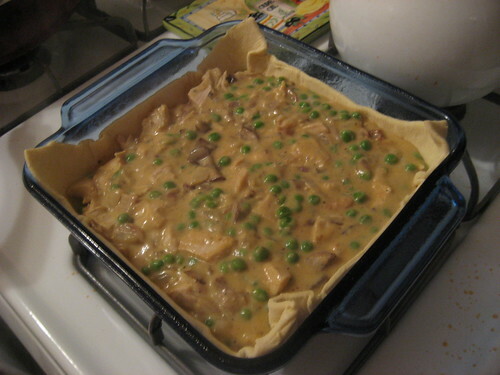 Place one pastry sheet in the bottom and poke holes in it with a fork. 6. Fill it with the turkey mixture and top with the other pastry sheet. Pinch it together with the excess from the bottom sheet, and poke more holes in the top. 7. I brushed mine with an egg wash (1 egg + 1 Tbs water) to help brown it. 8. Bake at 400 degrees for 35-40 minutes. Once it's out of the oven, let it set for about 20 minutes before you cut into it. Over Thanksgiving I bought some coffee liqueur to use in my flourless chocolate torte. While you might be thinking I bought Kahlua, you'd be wrong. Turns out, Kahlua is kind of expensive, especially when I just needed 1/2 cup of it to cook with! So I opted for the budget option, Copa de Oro. Okay, I'll get to the point of this post - I now have an almost full bottle of Copa de Oro and am struggling for ideas to get rid of it. Also in our bar is a bottle of Irish cream liqueur. Bailey's, you ask? Nope. Coole Swan. You know it's cool when there is an extra "e" at the end. Anyway, it's made in Dublin and tastes just like Bailey's. I figured these two liqueurs would go well together, and added some vodka to kick it up a notch. I used equal parts of each, shook over ice, and strained into a martini glass. And as it turns out, it was really tasty! I was very excited to blog about my new cocktail invention. But, after about 10 seconds of Google research, I discovered that this, in fact, is a Mudslide. The very cocktail that I'm always tempted to order at Applebee's (where I can get it with ice cream, too). So, there you have it. What started as a cocktail revolution turned out to be a (budget) Mudslide. Tasty, though. I'll have to try a blended one next time. 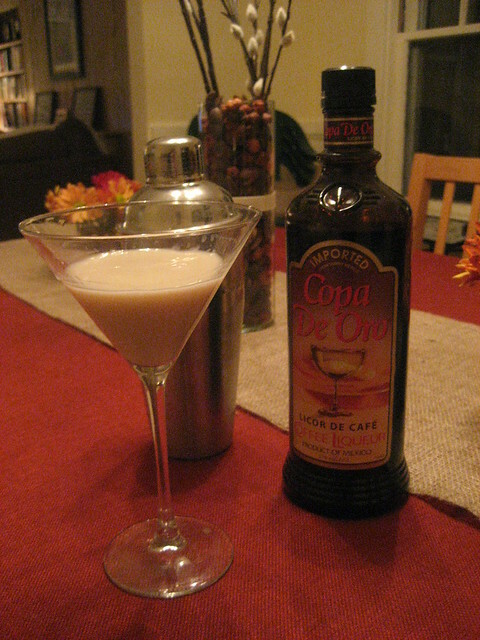 Anyone else have any uses for Kahlua/Copa de Oro? Disclaimer: this looks gross. It's not. It's actually quite tasty. I got turned on to the whole Green Monster Movement by my friend Clare at Fitting It All In. If you haven't heard of these delicious smoothies, read the whole back story here. 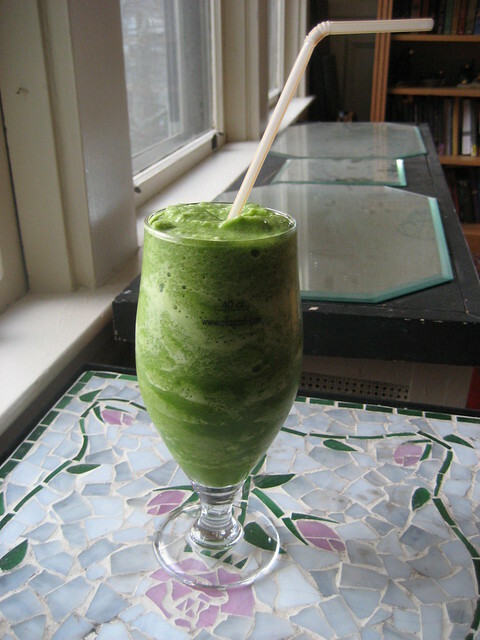 Basically, a Green Monster is a smoothie made from spinach, banana, milk, ice, and whatever other accoutrement you want to put in. Yes, it looks super green, but the banana actually cuts out all of the spinach flavor (which is pretty mild to begin with, anyway). 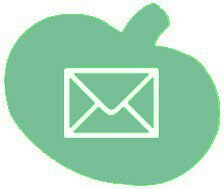 If you've read my other food posts, you know that I am not exactly a health nut. (Please refer here for exhibit A.) So if I think these are delicious, you might too! Since my first Green Monster last week, I've experimented with adding other ingredients, such as peanut butter, strawberries, pumpkin butter, and cocoa powder. So far, so good. Last night I made one with fat-free Greek yogurt in place of the milk, and it was super creamy, more like a milkshake. On top of tasting yummy, this is a great way to get in a bunch of fruits and veggies to your daily diet. Try it. First, blend the yogurt, spinach, and milk. Then add the frozen banana and blend until smooth. Finally, add as much ice as you want for your desired consistency and blend. Okay, obviously any holiday meal is nothing without something sweet at the end. I'm a bit, um, infamous when it comes to my love for rich desserts, so this Thanksgiving was no exception. 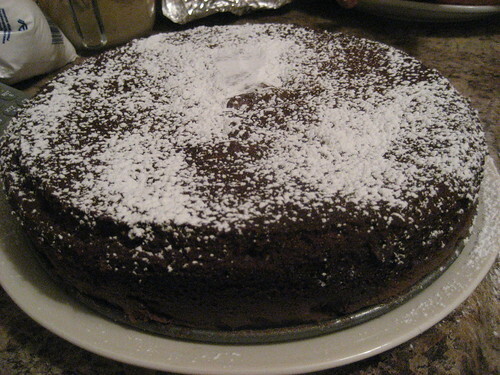 Flourless chocolate torte from Emeril's recipe. Amazing, for all you chocolate lovers. Closer to a brownie than cake, it's almost like a truffle. I made this a night ahead of time and chilled in the fridge, so it's an easy part of the meal to get out of the way early. Cranberry sauce. A Thanksgiving staple, but I don't really like it on my turkey. Good news: it also makes a great topping on anything chocolate. 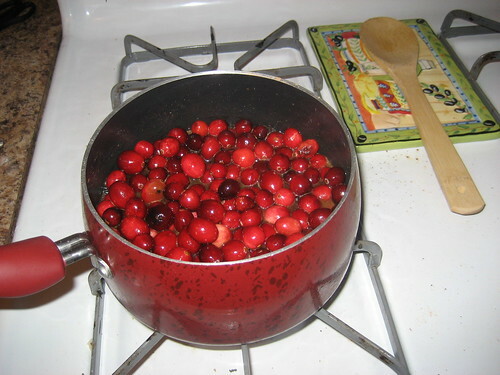 Mine was simple: a 12 oz bag of cranberries, 1/2 cup sugar, 1/2 cup brown sugar, 1/2 cup orange juice, and 1/2 cup water. Also made the night before. I'm biased toward all things chocolate, but one exception is cherry pie. 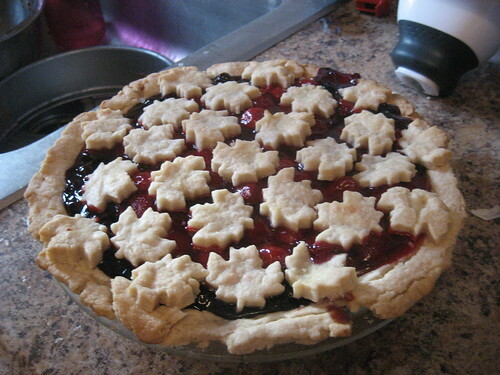 Oh, my, god, I love cherry pie. This is actually cherry / blueberry / strawberry pie, but just as good. 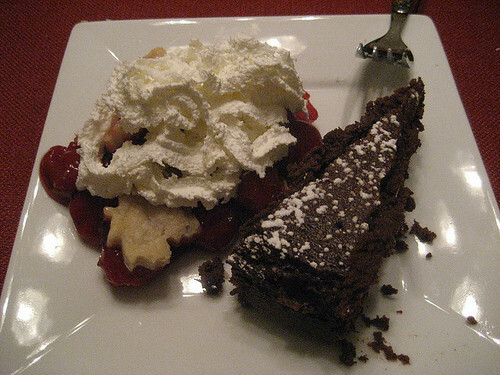 My friend Carol made this delicious dessert, including the crust(s), from scratch. Aren't those leaves beautiful? By far, my favorite part of thanksgiving: all the starch. Especially stuffing. 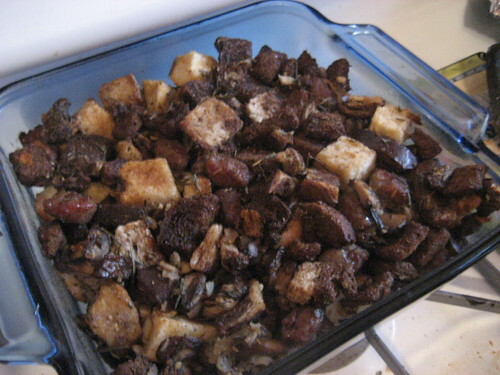 I made my dad's classic stuffing, although maybe it's technically "dressing," since I cooked it outside the turkey. I started by slicing and lightly toasting bread: sourdough, pumpernickel, and a marble rye. 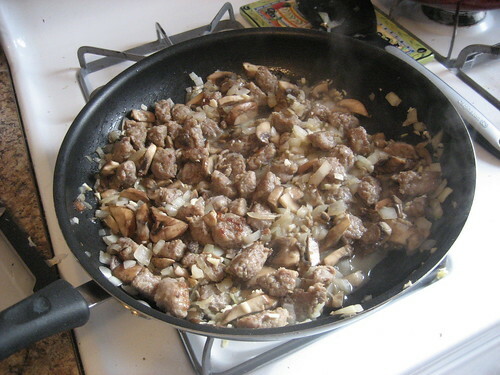 Then I sauteed some Italian sausage with "baby bella" mushrooms and chopped onions in some butter. I tossed the bread with rosemary, oregano, salt and pepper, then added the sausage mix and finally a couple eggs to coat it. Once it was in the baking dish, I basted some turkey drippings on top to moisten it. Delish. 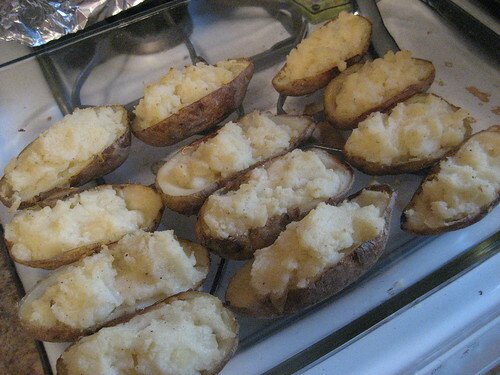 Twice-baked potatoes made by Sophie; also delicious. 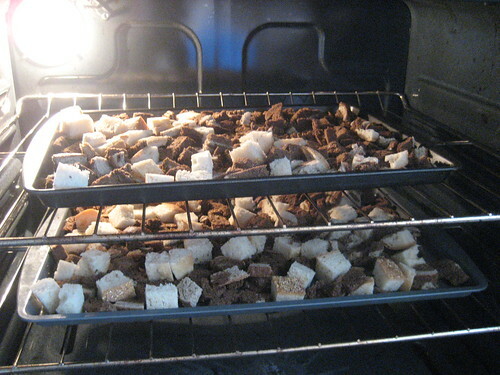 I have plenty of leftover bread, so I may have to make more stuffing in the near future. Anyone else have a favorite carb-y side dish to share? The most daunting part of hosting Thanksgiving dinner was probably making the turkey. I've been told that "you can't mess up a turkey," you just stick it in the oven and "let it cook." I did not intend to do either, so I did a fair amount of research online, and was helped greatly by Alton Brown and my dad, who served as my Butterball hotline for the day. In short, I defrosted the turkey in a 4 gallon tub of water, in the fridge, for 24 hours. Wednesday night, I dumped the water and replaced it with brine: 2 gallons water, 1/2 gallon white wine, 9 oz Kosher salt, and about 1/2 cup of sugar. After 12 hours in the brine, it was ready to go into the oven on Thanksgiving morning. 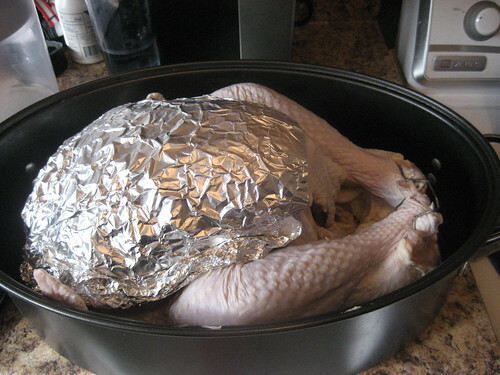 Before cooking, I fashioned an aluminum foil breast plate (see above) that would be used later. First I cooked the (bare-breasted) turkey for 30 minutes at 500 degrees to brown the breast. 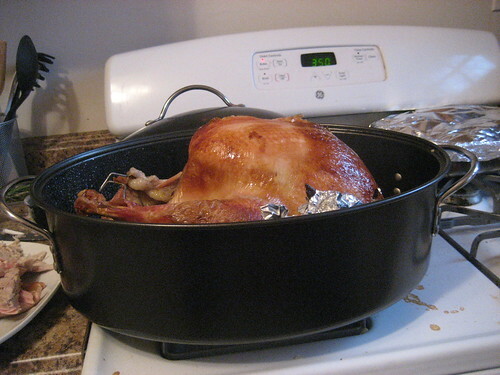 Then I fastened its turkey bra on and cooked for another 2 1/2 hours at 350 degrees (this was a 15 1/2 pound bird). 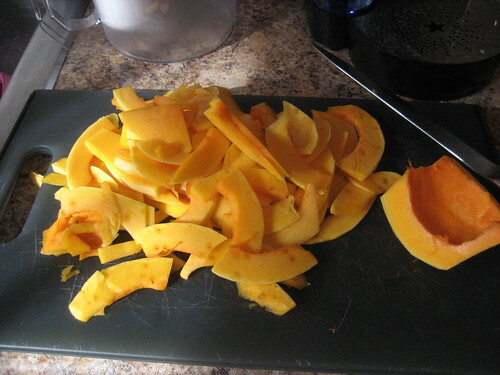 After it cooled for about half an hour, the carving began. Turns out, none of us had any experience carving a turkey, and I have no decent knives for this purpose. A fair amount of turkey shredding ensued. It was still moist and delicious. And so far, no food poisoning related deaths. Stay tuned for side dishes later this week. Yesterday I hosted Thanksgiving at my apartment. It was just three of us: my sister Sophie, my friend Carol, and myself. 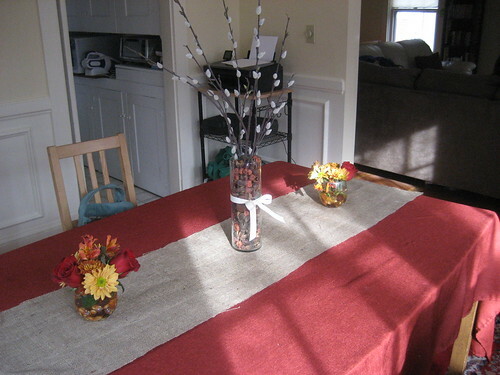 I figured there was no need to go crazy on decorations, but I wanted the dining room table to look festive, so I started with a centerpiece. All of this being for one day, I decorated on a budget. Voila! Centerpiece done. And smelling very autumnal. 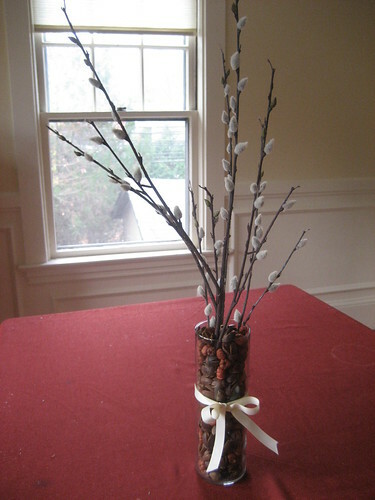 This would be very easy to replicate for Christmas too; winter potpourri, pine branches, and some Christmas ribbon. Next up, flowers. 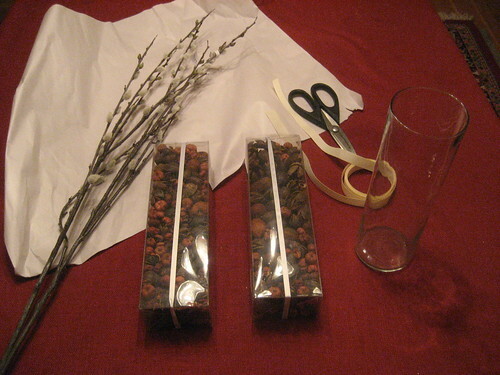 I cut down a cheap bouquet and set them with fall-colored glass beads, complete with glass acorns. 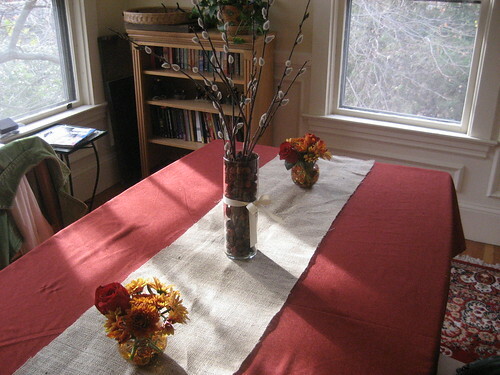 For a table runner over our red tablecloth, I went to a fabric store and bought a yard of burlap. 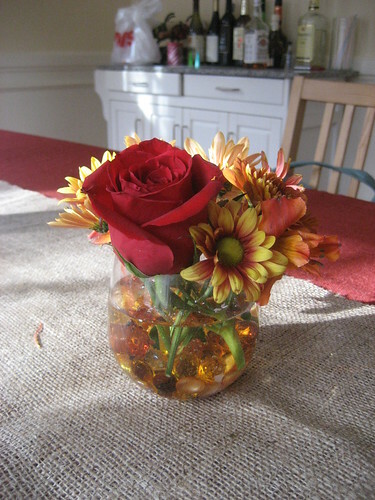 Less than $5 and a perfect rustic touch! The bar needed some love too. 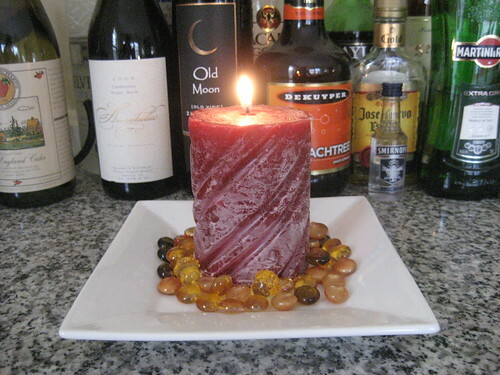 I had bought candles hoping they would fit in the stemless wineglasses (before I decided on flowers), but no go. I got use out of one though! After a half day at work and two hours downtown running last minute Thanksgiving errands, I was ready for some comfort food this afternoon. 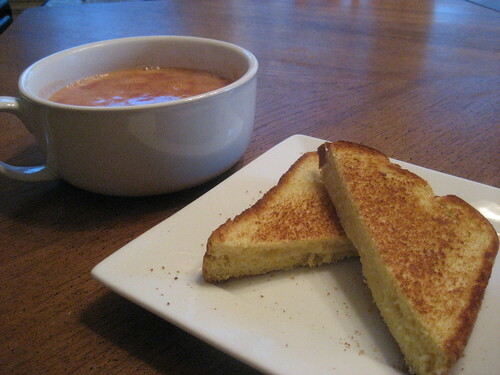 This is no novel idea, but sometimes I forget how good a grilled cheese and bowl of tomato soup is, especially on a blustery fall day like today. There are obviously fancier options out there, but this is just straight up Campbell's condensed tomato soup. The sandwich is on potato bread (my favorite) with extra sharp New York white cheddar and a dab of pesto. Yummy. 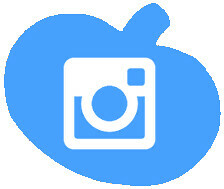 Stay tuned for a series of Thanksgiving posts! I'm indulging this morning in some delicious Boston Cream Pie. 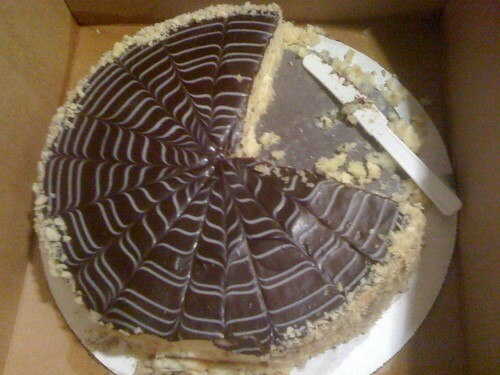 Not just ANY Boston Cream Pie, but the ORIGINAL Boston Cream Pie. Not actually a pie, this classic dessert is made of two layers of sponge cake sandwiching cream or custard and topped with a chocolate ganache or glaze. The Parker House's version is adorned with toasted almonds on the side of the cake. Their cake was fluffy and moist, and the ganache had an amazing semi-sweet flavor. This was the perfect breakfast treat on a slow Monday morning, paired with a hot cup of Earl Grey. 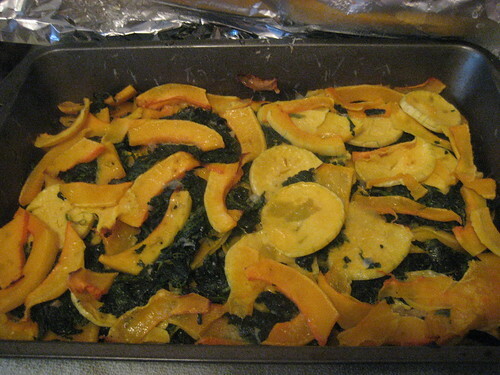 Find the Parker House's recipe here, via Bobby Flay. Like many of the near-useless things I covet, cute aprons are generally overpriced and not as functional as an old, plain alternative. Oh well. They can be so damn pretty, especially for the holidays. My friend Eleni recently shared this specialty apron store with me, featuring a hostess apron in Tri Delta colors. Her request: find a way to make said apron, because $100? Really? 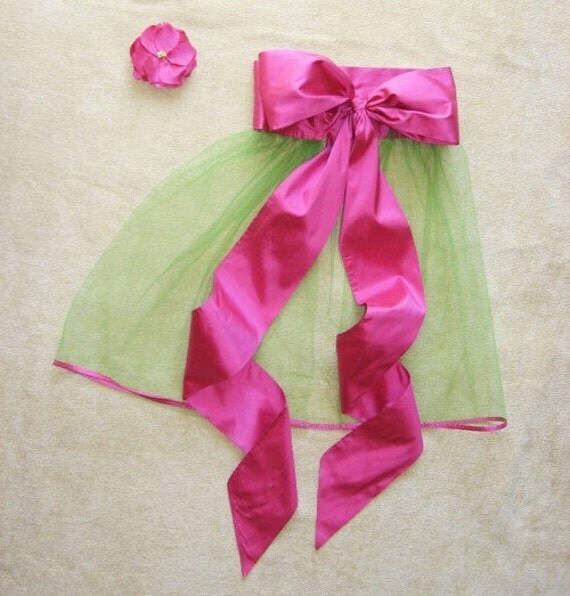 This tulle apron, by Etsy seller CateChestnut, is almost identical in pattern to the $100 option, but for only $26. Plus it comes with an adorable matching pin, if you find yourself needing to be more coordinated. I own this frilly option from Target - kind of a silly phrase, but I love the lace detailing. 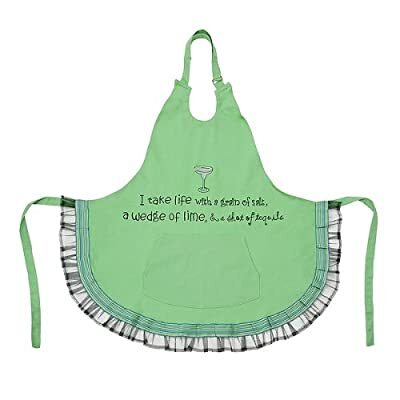 This apron actually comes from a website called FlirtyAprons.com, which I have shamefully ordered from before. I gave a blue and brown design to my sister last Christmas (I'm not sure if she flirts in it or not), but this cupcake pattern is more my style. Oh Etsy, how do I love thee? Let me count the aprons... 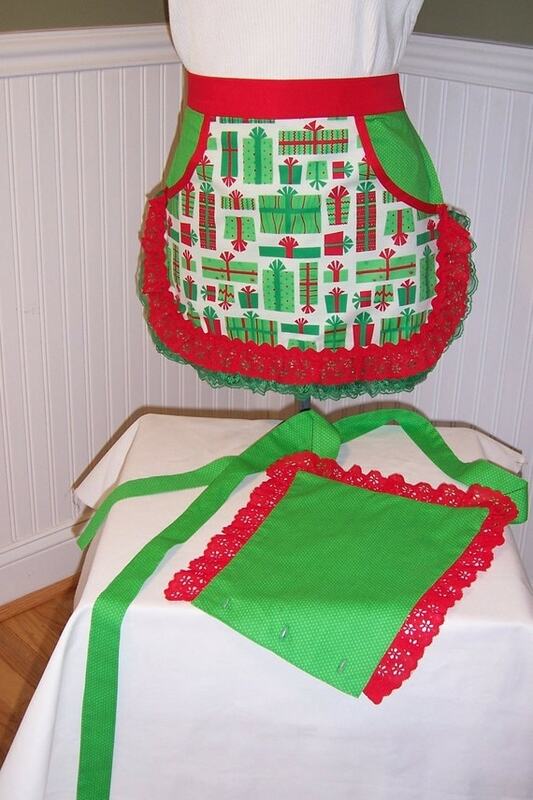 This Christmas-themed hostess apron from seller SunlightCreations features a removable top that buttons on. I love the geometric gift pattern on the bottom! Well, there you go. Four great options for when you need to bake something and look damn good doing it. I went to NYC this weekend, and while you might think the most memorable part of my trip was something other than a cookie, you'd be wrong. Not that New York doesn't have a lot to offer; this cookie was just amazing. Details: $4 is steep for a cookie, but this thing is a) huge and b) more like a brownie. It took me two days to finish mine (although my boyfriend polished his off in about two blocks). They also come in Chocolate Chip Walnut, Dark Chocolate Chocolate Chip, and Oatmeal Raisin. You can order online, but prices are even steeper there. Visit in person for a fresher, cheaper cookie! Any other favorite bakery suggestions? 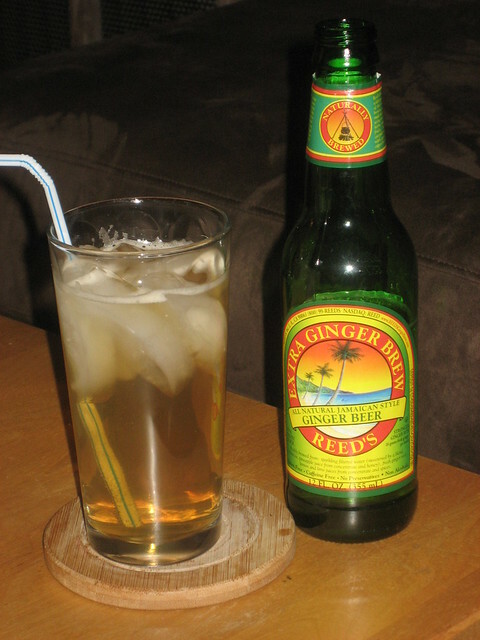 Dark and Stormys are the more popular cocktail, made of rum and ginger beer, but I'm not big on rum. I saw the Mark & Stormy first at Redbones, a BBQ restaurant in Somerville, MA and it's the perfect combo: refreshing ginger beer and Maker's Mark whiskey. Full disclaimer: this particular shot is of a Jim 'n' Stormy, because maybe I'm too cheap to have Maker's Mark in the house at all times. Due to some peer pressure, I've entered a soup competition* sponsored by New England Country Soup. The idea is to create a soup that is similar to one of their 8 flavors, and the recipe will go head to head against it. 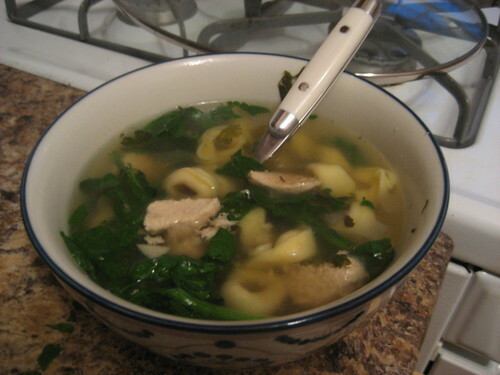 I chose their Nana's Chicken Soup to challenge, and created a chicken, tortellini and spinach soup. Made in a crock pot, this was pretty simple to whip up. 1. 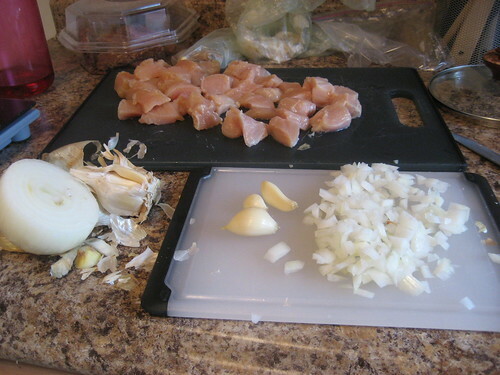 Prep your ingredients: cut up chicken, onion, garlic, cilantro, and any fresh herbs. 2. 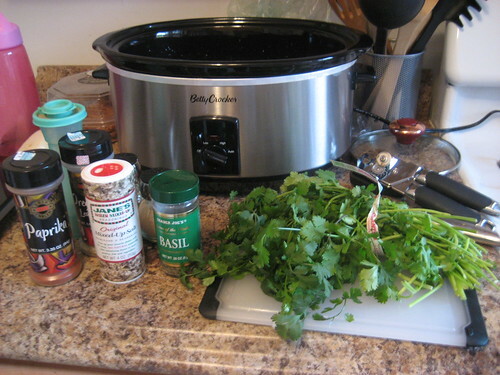 In a crock pot, combine chicken, chicken stock, water, onion, garlic, cilantro, and all seasonings. Stir together and set on low heat. 4. Stir in tortellini, cook for an additional 20 minutes, or until pasta is desired texture. 5. Turn off heat and stir in spinach leaves. Serve with a nice crusty baguette. * Disclaimer: Although I talk the talk, I have never actually made soup before this, so I really don't walk the walk. Take any smack talk with a grain of salt. Cake, ehh. Give me brownies. I like as much chocolate crammed into as much fudginess as possible. 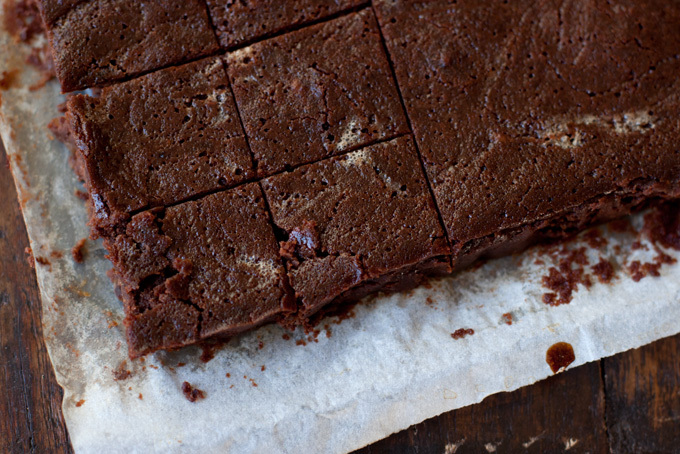 But for a twist, here are a few brownie recipes that stray from the norm. Like using beer (and cayenne pepper) for a lighter texture: Beer Brownies from Huffington Post blogger Claire Thomas (pictured above). Or one of my sister's favorites, Black Bean Brownies. I'll admit, these have an interesting after taste, but they are a healthy, still-fudgy, alternative to traditional brownies. And who doesn't love brownies cooked inside citrus? 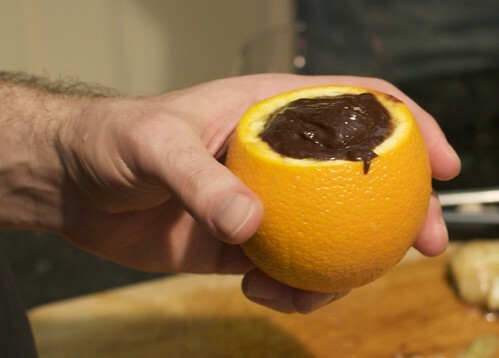 This is a traditional brownie batter spooned into a hollowed-out orange and baked. Don't worry, the orange doesn't burn due to its high water content. 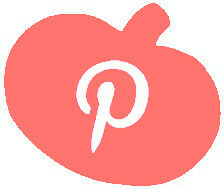 Check out Cooking for Geeks for other weird creations. If these are making you squeamish, I recommend Alton Brown's recipe for a delicious, beer-free brownie.